Our first game of round four saw Melbourne Athletic take on Pascoe Vale in what was a crucial game for both who sat on three points each. It was Pascoe who drew first blood after a Lucas Vaz strike took a slight deflection on its way in to open the scoring. A lot of chances from Pascoe Vale but they could not break through as Melbourne were defending hard and kept the score at one at the half. 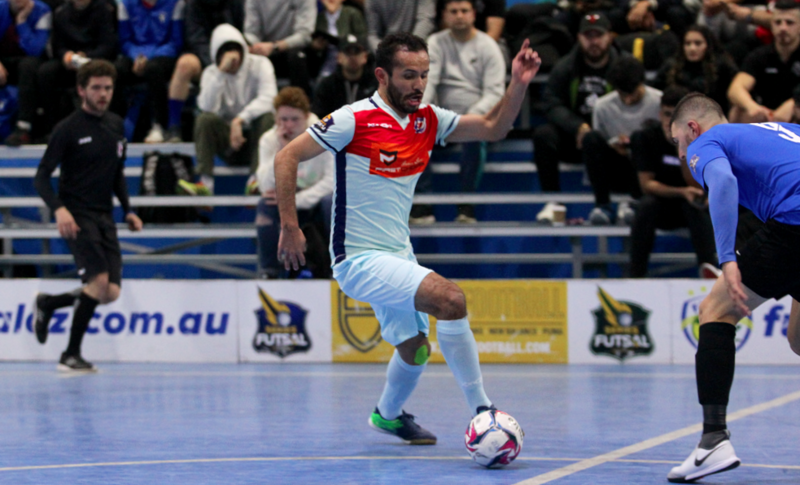 The game continued along the same lines though Melbourne began to create more chances on the break and were unlucky not to be back in the contest with Felipe Bley proving amazing in goals. It got a lot more difficult for the Bravecats as Lucas Vaz had the easiest of finishes heading in from half a meter out to double the lead. Melbourne had their chances but just couldn’t find a way through and were again punished as Andre Caro converted a set piece routine to make it 3-0. That was all the scoring done and dusted as Pascoe recorded an important 3-0 win but it was far from impressive as Melbourne put up a good showing. Next up saw two sides both locked on three points and a must win game for both. The Wolves had the better of the first half as they added four goals to two with Long, Ramadan, Sesay & Beckett all finding the back of the net, while for Hume youngsters Temel & Bayrakli netted to keep them in it. Early in the second half a rocket from a side ball from Muhammed Temel saw his side close within one, and soon after Temel turned provider for Bayrakli to tap home to have Hume level. 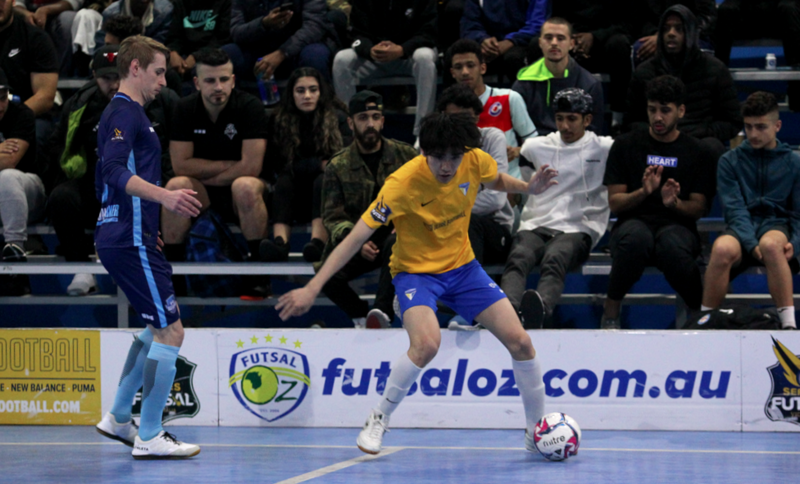 Wolves regained their lead as Lokman Ramadan picked out the bottom corner but Hume were given a life line as they were awarded a ten meter penalty which Ubeyde Cicek stepped up and converted to level the game again. Moe Matar missed a golden chance to put Hume ahead, before another ten meter penalty went Hume’s way, though this time Cicek put it wide and we went to penalties. Plenty of penalties were converted in the shootout but Bayrakli converted the all important winner to seal a huge three points for Hume. 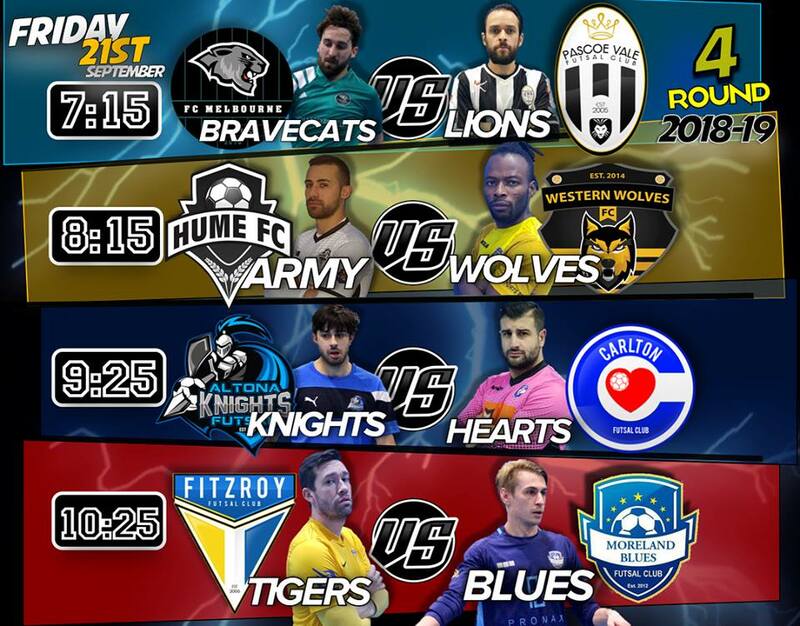 Next up saw newly promoted Altona Knights take on thee time Champions Carlton Heart in a real test for the newcomers. Early on it was Altona’s main man Frano Saric who opened the scoring with a shot from on half way, before Jayden Merceica doubled the advantage to have the Heart on the back foot. Josh Pulvirenti would pull one back for Carlton as he finished at the back post, but the Knights were in the mood and after Kojo Brown’s initial effort was saved, Simon Menichelli followed it up to restore the two goal buffer. A long ball was finished off by Merceica as the lead was extended to 4-1 before Brown finished his one on one chance as the Knights were blowing the Champions away leading 5-1 at the half time break. Early on the second half Pulvirenti found the net for a second time to keep Carlton in it and they seemed reborn in the second half, Chaaban Rajab then rolled onto his left foot to finish, and the Heart continued to pile on the pressure getting another through Pulvirenti who turned home a shot from Rico Hauser to put Carlton within a goal. A scramble on the edge of the area saw the ball fall for Menichelli who converted to again have Altona leading by two, before a five meter penalty was awarded to Carlton which Rajab dispatched to keep his side in the game. It seemed to be Altona’s night though as Brown finished once again to have his side leading 7-5. Rico Hauser struck to have Carlton within a goal, and a ten meter penalty went he Hearts way with only 15 seconds on the clock, Ernie Simsek saw his effort saved by Saric to all but seal the win for Altona. However the drama wasn’t over there, as just four seconds later Victor Cruz marked his Carlton return with a goal to send the game to a shootout. 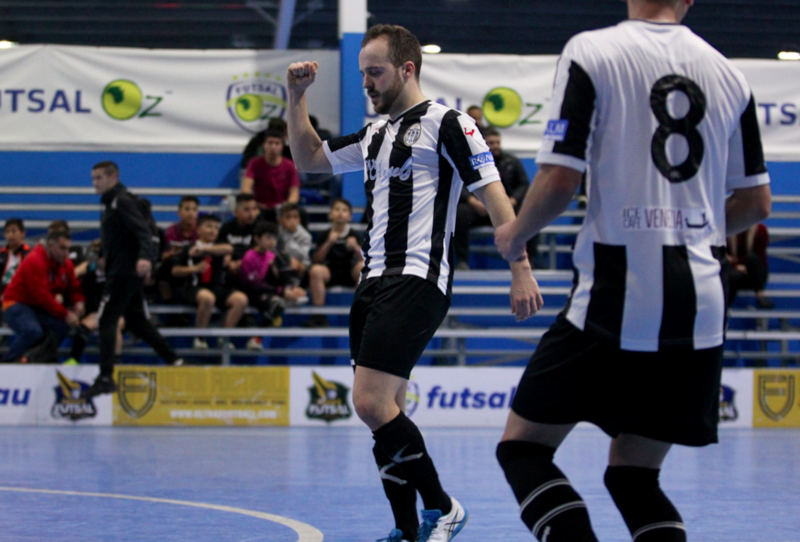 Rajab and Simsek converted their efforts in the shootout, while Hichem & Tony Saric both missed as the Heart clawed their way out of jail for a crucial three points. 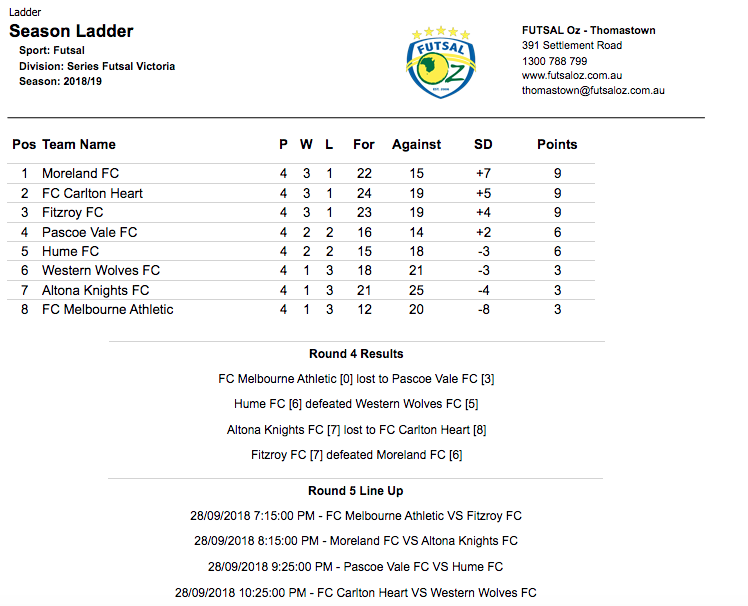 The final game of the round was the clash of the night as third placed Fitzroy faced ladder leaders Moreland. The Blues were the only undefeated side left in the competition, but they didn’t start the stronger as Scott Rogan teed up Leo Kimpara who converted his chance with a classy back heel to open the scoring. Directly after a time out Moreland hit back as their throw in was headed home by Abdirizak Ahmed to level proceedings, but Fitzroy were peppering and regained the lead when Jose Filho found Kimpara at the back post to tap home. Kimpara would complete a first half hat trick as he cut onto his left foot and picked out he top corner for a 3-1 lead. Late in the half another throw in from Moreland was finished off by Atay Ibrahim at the back post at the Blues went into the break trailing 3-2. Fresh from the half time talk Moreland drew level when Adam Coopers long range effort went through two sets of legs on its way in to tie the game at three. 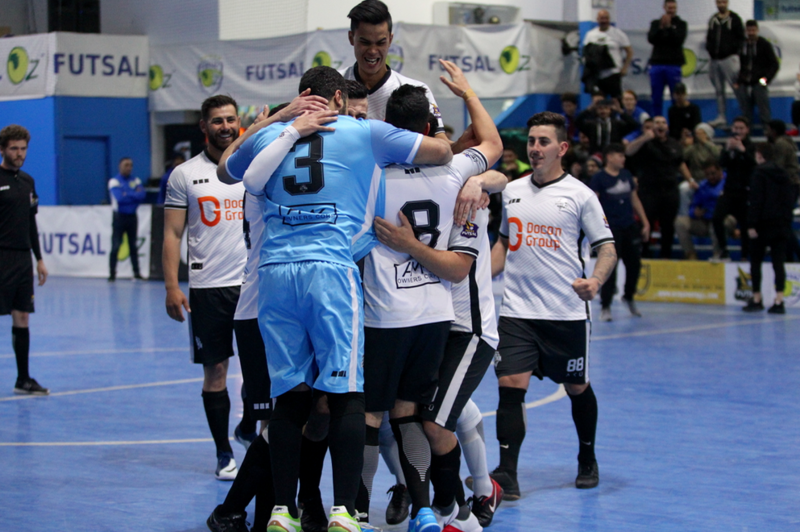 Fitzroy again regained the advantage when Scott Rogan converted from a free kick, before Jose Filho finished his one on one chance to restore the two goal lead. The Tigers were up and about and kept adding to their score a throw in from Fitzroy was headed home by Corey Sewell to make it 6-3, before Rogan found the net again as Fitzroy had piled on four unanswered goals. Moreland struck again through new signing Abdirahman Ahmed to stay in touch, before Cooper found the net from range again on his left foot. With only six seconds remaining Cooper set up a grand stand finish as his found the top corner, but Moreland would fall just short as Fitzroy took the points.